A teacher friend recently came to me upset after receiving her evaluation. Usually rated “highly effective,” she’d received a rating of “effective” this time. The reason for this “slip”? She was tired of missing her first0-grade child’s soccer games on the weekends. She’d taken overtime spent in the classroom and spent it with her family instead. She was upset—and so was I! I told her she shouldn’t dare go back to sacrificing time spent supporting her child to toil away in the classroom during her rightful time off. As teachers, our work doesn’t end when the last child files out at the end of the school day. We spend hours upon hours prepping, perfecting lesson plans, entering grades, keeping our inboxes cleaned out, and staying up-to-date on the latest instructional methods. Most teachers are perfectionists by nature. We run on high-octane fuel to ensure all of our ducks are in a row before the next day, the next week, the next lesson. Teachers are sacrificing everything from their personal time to their personal sanity. Worst of all, this extra work and worrying doesn’t always guarantee the results we want to see from our students. It’s leading to major burnout. When your work life is so full, so demanding, that you don’t have time for the people who matter the most, well … it’s time for a change. It’s time to remember ALL of the things that are truly important in your life and work to prioritize them. My friend, Matt Miller, author of Ditch That Textbook writes about this philosophy. 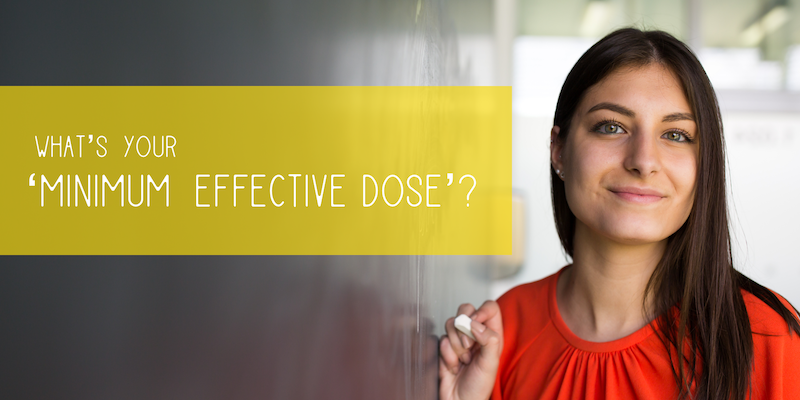 He calls it finding the MED—the Minimum Effective Dose. He says we can begin to change our lives as educators by optimizing our time and resources as educators. Tim Ferris, author of The 4-Hour Workweek, defines the MED as “the smallest dose that will provide the desired outcome.” And he says anything beyond the MED is wasteful. Take his example of boiling an egg. The MED to boil water is 212 degrees Fahrenheit. Sure, you can boil those eggs at 329 degrees … but it won’t make them more boiled. The higher temperature simply consumes more resources that could be applied elsewhere more productively. Ask yourself (and be honest! ): How much more effective are you as a teacher if you spend less time in the classroom than another teacher does after the bell rings? My thoughts? Teachers are simply trying to do TOO MUCH—arriving early, leaving late, working through lunch, working at home, spending time in the classroom on weekends and holidays. Extra time is occasionally necessary; that’s just a fact of life. But we have to recognize when putting in overtime is actually making a difference—and when we’re doing it out of guilt, worry, or misplaced obligation. Each teacher needs to figure out his or her MED, and then KNOW WHEN TO STOP! And I think the answer comes down to happiness. Scientific research has proven that when we are happy, we are 31% more productive. I’m increasingly getting called into schools to teach and speak about the science of happiness. Administrators are recognizing that good teachers are reaching a breaking point. They’re understanding that it’s not about working harder; it’s about working happier. And because I know teachers are ready to quit “over-boiling their water,” I inject happiness tips (and a whole lot of fun) into my workshops. I think you should enjoy your time as a teacher even when you’re getting professional development. So, Teacher Friends: Let’s start valuing well-being over work worries—and doing what we need to do to reclaim our time and happiness. You’ll be a better educator for it, I promise!